I began volunteering with The Grace Factory when the Vaal Branch started two years ago. I was drawn in by the enthusiasm and passion of Ellouise, who leads the branch, and have stayed because of the meaningful help we are able to offer in our community. I’ve found that volunteering, in whatever way, big or small, depending on the season of my life, has been a blessing to me. It is definitely something that I have grown to value and want to share with my young sons as they grow. There’s a lot said about how gratitude and the chance to help others helps us to live healthier and happier lives. I have found this to be true for me. Being involved in knitting for and helping to pack The Grace Factory maternity packs was a good starting place. I still find it exhilarating to be involved on packing days. As one scurries around doing ones little bit it is amazing to look up over the hall and see the energy and fellowship that pours out into the effort of packing quickly and efficiently. What a sense of joy at the end of the day! Over time I have also become involved in sorting and packing the children’s clothes donations into age and gender appropriate packs. Once there is enough of a certain size clothing I bring it all home and slowly go through it, checking the quality of the clothes as I sort them into piles of types of clothes (e.g. pants, t-shirts, dresses). Whilst packing I make sure to include a number of items from each clothing type, covering different seasons and always hope to include a particularly pretty or cute outfit in each pack. As donations allow we have also been able to add sippy cups, knitted or soft toys, hats and shoes. In distributing the packs one sees how important a pair of shoes is for the child and their caregivers. As I work on the clothing packs I am often surprised by small blessings, which make me smile. I enjoy thinking of and praying for both the families who have been generous in donating their quality used and sometimes still new clothes and the children and their caregivers who will receive the packs. I imagine a child or caregiver enjoying the chance to chose from different outfits in the pack. I’m often surprised by and amazed how little matching pieces of an outfit (although mixed up in the donation box, washing and sorting) come back together in a pack without me even realising that it was a set. I’m surprised by the way that the numbers of items in a pack work out so well and I often have a feeling that my small efforts are indeed covered by Grace. The clothing packs make so much sense to me. It is easy to ask for clothing donations as it gives families an easy option to keep their cupboards clutter free knowing that their donation will have a meaningful impact in another child’s life. It also seems to make it easier for people to part with sentimental items knowing that they will be well used and loved by someone else. On the receiving side I feel that the way that the packs are presented show a great deal of respect and caring. We only include clean and good quality clothes. They are neatly packed and offer roughly a week’s worth of clothes for a variety of weather. The fact that the packs are carefully sorted according to gender and size means that caregivers have immediate access to the right clothing for their child rather than needing to store clothes. 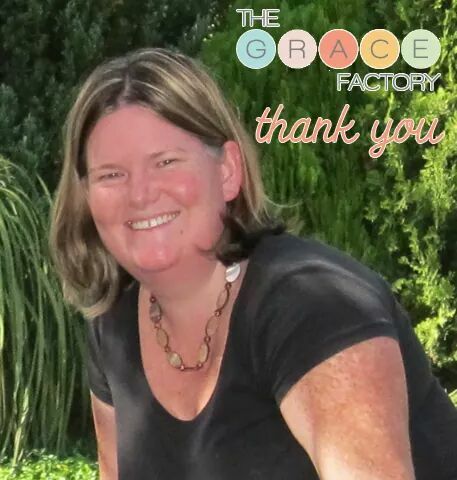 I have so enjoyed becoming a part of The Grace Factory and I hope that it will continue to be a wonderful blessing in so many people’s lives, including in the lives of its volunteers.